O special day, this Easter Sunday. For many, Easter is a religious day celebrating the resurrection of Jesus Christ. Church activity is heightened among some denominations, and families connect. A heartened feast often results. Happiness is spread, and celebrations connect with later traditions not religious. In many places, this will involve bunny rabbits and decorated eggs. Children laugh and cheer, and usually encouraged to go outside and play. Also on this day, there are public holidays, bonfires, butter lambs, and other cheerful activity. There is plenty good fun for everyone, I think. Meanwhile, I am having fun while thumbing through some pictures I snapped from the recent 2013 Sakura Con, an annual Japanese animation festival held in Seattle. Time will wait for me to properly edit, upload and share these pics. Above is an appropriate bunny pic for today, and a preview of what’s coming from my blog. And below is another exclusive sneak peek. Look forward to the rest! 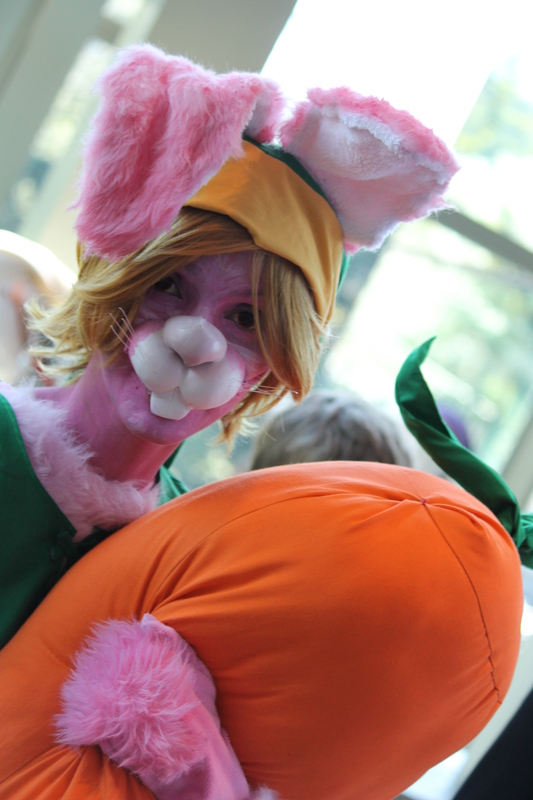 Posted on March 31, 2013 by Orion T.	This entry was posted in Uncategorized and tagged anime, bunny, cosplay, Easter, fun, Sakura Con, Seattle. Bookmark the permalink.